LC: From my first memories, I have always loved art. I took art classes all throughout my childhood, but stepped away from creating art for about 10 years when I went to college and then to New York. I was in the fashion industry in NYC and worked in sales for Alberta Ferretti. It wasn’t until I moved to Los Angeles that I got back into painting. From that point, I haven’t stopped! And I knew right from the beginning that I wanted to bring my art full circle and create wallpapers and fabrics to dress the home. When I moved back to Richmond that I really focused on growing my company. I was able to focus 100% of my time on painting, product development and marketing. My business is constantly growing and evolving. My next venture is rugs. Expect to see them in the next few months! AW: What kind of creative process, routines or rituals do you have? LC: Go go go! That’s my routine in a nutshell. AW: What is integral to the work of an artist? LC: To be in the right head space to create. Each part of what I do requires a different creative process— from painting; to building and editing patterns; to planning and developing colors; to figuring out which applications and scale would work best. I have to block out time for each of these creative processes and have to be in the right mindset to tackle each of them. AW: Tips or advice you would give to someone trying to pursue a career in art and design? LC: Never stop experimenting. It’s important to continue learning and pushing the limits on your creative process. AW: Do you ever experience creative blocks? How do you overcome them? LC: Yes! Everyone in art and design must have creative blocks! I find that sometimes its through these blocks that you push yourself past your comfort zone and learn something new. And sometimes, I creative blocks require a full break. A chance to reflect. I do my best reflecting outside— either riding my bike, going for a walk, or just playing with my dogs and family outside. Travel always helps too. Seeing new places and having new experiences always helps. AW: Who are a few artists/designers you admire and why? LC: Gerhard Richter. His use of color, layering and depth is so inspirational. Motherwell for his shapes, proportions and use of black and white. AW: What are your everyday essentials? LC: In the studio— empty glass jars for mixing paint. When in the office, my cutting board, electric stapler and printer get a serious workout. AW: A typical day in your life includes…? LC: I am typically an early riser. I work out of my house, so I usually go to the kitchen, get my cup of coffee and head to the office pretty early. It’s a really tough commute 😉 Then my son and husband get up around 7, so I stop and take a break with them and have breakfast. Once my son is off to school, I find that mornings are a great time to catch up on things. I usually like to head to the studio and get in a few hours of painting while I am fresh, then back to the office to work on sample requests, order processing, design work, etc. The end of the day is family time. We all have dinner together and then relax for a bit before heading to bed. AW: When do you feel most inspired? LC: When I come up with something new that I love or help someone create something custom that they love! Or when I see how a designer has used my wallpapers, fabrics or art in a unique and different way. I love to see how creative people are with design. Sky is the limit!! LC: Small paintings framed with a big mat board and frame. I always love juxtaposition. AW: What do you do when you are outside of your studio? LC: I chill with my son, husband and two frenchies. My son is 14 months old, so my time off is really all about him. He is growing and changing so much each day, it really is so much fun to watch! Follow Lindsay’s Instagram feed to stay visually inspired and up to date on her latest designs and installs… I dare you to not heart every image! When it comes time for product sourcing for design projects, there are many hours spent scouring through catalogs, showrooms and websites to find that one perfect piece. Over the years, I have accumulated quite a few favorites in the sourcing department, and one of my absolute favorite manufacturers is Alfonso Marina. Their furniture goes from elegant to eclectic without skipping a beat and I just love the timeless beauty of their furniture. 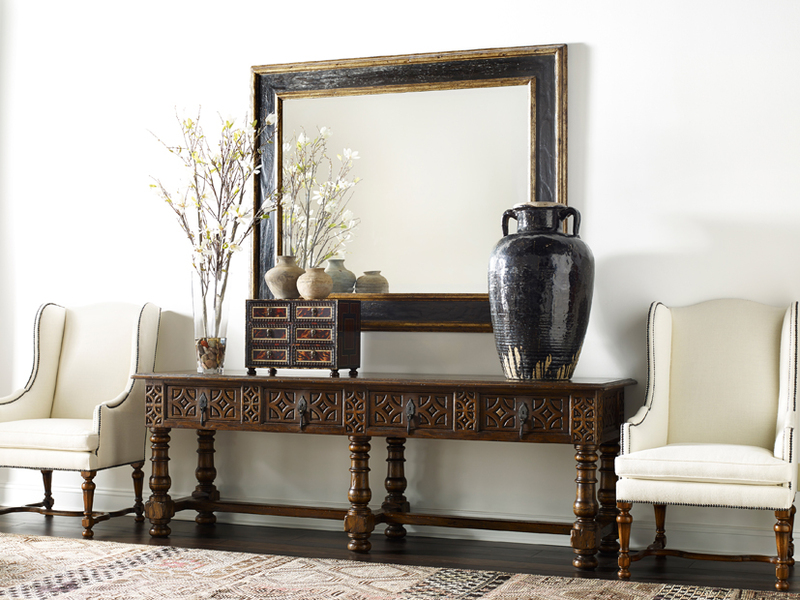 There is almost always a spot in someone’s home for a piece of Alfonso Marina! 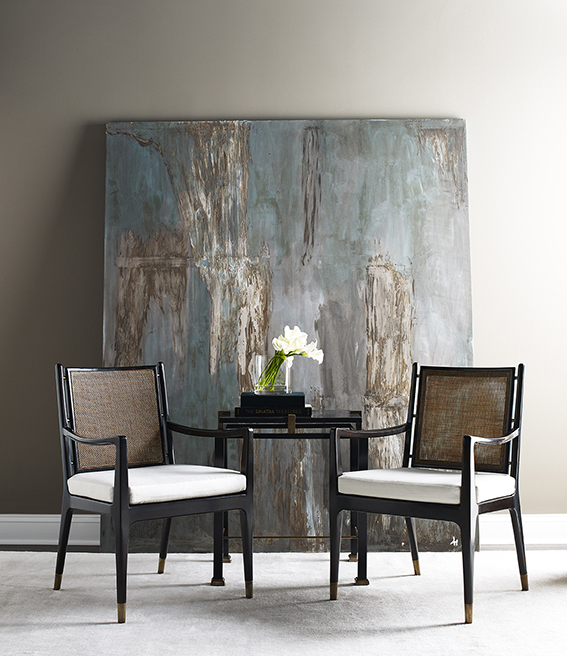 Swooning over these new armchairs – the perfect accent chair for a conversation nook. This glorious armoire will bring so much ethnicity to any space it occupies! Visit Alfonso Marina and tell me what piece you fell in love with! Play dates and sleep overs are top priority in the life of a kid, so why not incorporate entertaining into your plans. Maximize all the space to make way for an extra bed, a play table or even a sofa! As they get older, the homework book gets thicker and the days get longer. Create a functional space they will be motivated in and inspired by. When their beloved belongings look like nothing more than clutter, it’s time to get creative with your choice of storage. Why not make this project extra special and ask for some guidance from your client – what artwork would they choose? This time of year will come and go, and come and go, but it doesn’t require a makeover every year. When you are ready to get your hands dirty with this labor of love, think of a space that allows them to grow. Classic colors or gorgeous fabrics that will stay current, swap out the bunk beds for a “big kid” bed – think guest room down the road (ok, maybe not that far down the road!) or add a sitting area for some alone time. Are you planning on making some decor changes before the school year commences? Please do share your ideas and inspirations! Can metals really be mixed? Yes. I don’t know where to start! Well, you came to the right place! Your first step should be deciding which metal you would like to be the most dominant in your space. Once you have established your fancy foundation you can start playing with the accents. Your eyes need something to rest on – an even amount of mix can be overwhelming. The warm metals, like gold or brass, are perfectly balanced when mixed with a cooler metal, like silver or chrome. Consider a gold light fixture above an island in a kitchen with brushed nickel hardware. Using varying shades of the same metal is technically considered mixing, but do consider texture (and shape). Contrasting textures and lines can be the deciding factor when it comes to making it or breaking it when mixing your metals. The Kitchen: It’s a place we spend so much of our time standing in, cooking in, entertaining in, and sometimes just quietly drinking a glass of wine in (alone). If you’re anything like me you need a little change here and there, whether it be moving a table or adding an accessory, a little something to update the everyday scene. A refresh. Let me be clear here – a REFRESH, not renovate! This post does not require knocking down any walls. Here are a few small ideas that may help you feel like a brand new you in a brand new kitchen. A fresh coat of paint – For some, this may be considered a renovation, but it really is worth the day (or two) sacrifice. It is truly one of the most noticeable ways to freshen up a space. The bold, yet subtle, choice of a new ceiling color is always an interesting. Plants – There is nothing like a living plant to freshen up a space. Yes, I said living. Raise your hand if green thumb is not in your vocabulary. Well, here’s your solution raised hands – succulents. They are low maintenance and come in so many different shapes and sizes – whether it be placed in a pot or terrarium, it will suit any place it occupies. As we breeze into April, I really feel like it’s time to stop and smell the flowers. No, I’m not referring to a sudden desire to get my green thumb on… I’m talking about taking my time for the small things. I feel a pretty wonderful month coming on and I want to savor every minute. Therefore, taking time to stop and smell the flowers. We are in the midst of Spring and all this flower smelling has me feeling inspired by blooms! They are not just everywhere in nature during this time of year, they are also showing up in the glossies – home and fashion. So, April’s Wachs Mix is blooming pretty! Shopping local for bouquets in brown paper wrapping. A burst of light. The only time when walking on flowers is a must. Delicate glass cacti – I’ll take all three! Inspiring reading – a must have subscription. Up close and personal on a bronze stand… so handsome. Tropical inspired fabric, I’ll take many yards please! A sweet bone inlay accent table, just begging for a chair to sit with. And last but not least, these elegant botanical prints – need or want? For my those who haven’t heard, The Wachs Mix is a feature in our monthly newsletter, if you have yet to join the list of fabulous readers… here’s your chance. And because I already love you I’m sharing some sweet tips on texturing. Art is the perfect outlet to express your personality in your home, furniture and accessories are part of your home decor story telling, but art is an expression of you. There is a reason one piece stands out to you more than another – so, what do you do once that to die for piece speaks to you? Buy it on the spot and hang it wherever you can as soon as you walk through your front door? Well, Mr or Ms go getter, it may not be quite so easy. When you are going to make an investment in a work of art (no pun intended), you may want to consider a few things before you commit. I would like to share a few tips and tricks with you so when you unexpectedly fall in love with a beautiful painting on your way to the grocery store, you will have been prepared for that moment. 1. Scale. Envision where that piece will go, is it the right size for the space? As a general rule, you don’t want artwork to overpower the piece of furniture it is hanging above and you certainly do not want it to be too small. If you have a large empty wall don’t be shy to use the whole space for one piece, and on the other hand, if you do not have a large piece to fill that space, then consider a grouping of small pieces. 2. No rule. There is no rule of thumb that art should blend in with its’ surroundings, but you may hear the advice that your artwork should balance your interior and remain consistent. Once again, there is no rule of thumb! In fact, I’m going to let Canadian artist, Zoe Pawlak‘s words talk us through number 2. 3. Compliments. Number three is a carry-over from number two. There is no rule that art should match your furniture, however, consider complimenting. Pick a color or two from your piece of art and coordinate that color with an element in your room – whether it is an accent chair or throw pillow. Let your artwork have one or two things in common with the room, this, in fact, will increase your art’s statement in the space that it is hung. 4. Framing. 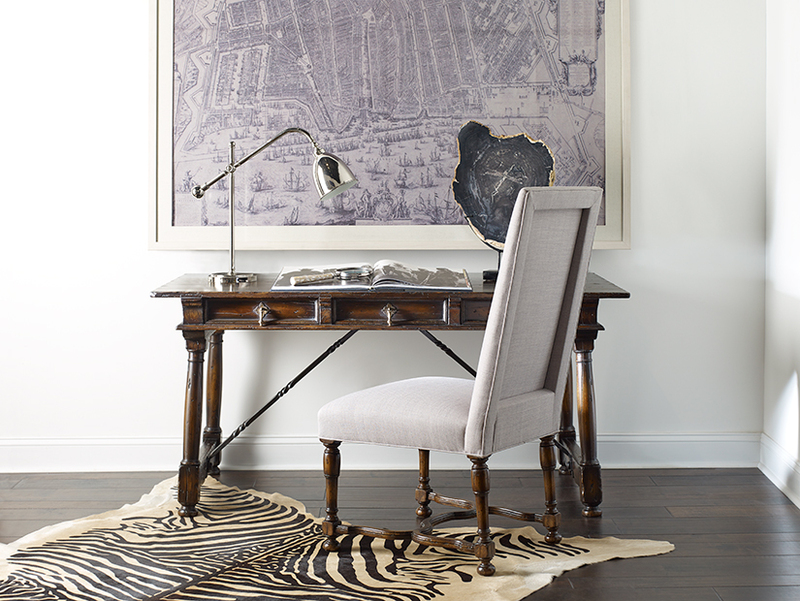 Not all art should be framed but when you have a piece that requires a frame, take a moment to consider your choice. Does your selection compliment the furniture or features of your room? Choose a frame to match your flooring, or on a more subtle level, if you have a pair of silver lamps consider a silver frame. Even if you are choosing a frame to add contrast to the style of your room, like a contemporary piece to a traditional room, just like we said in Number Three, a little compliment will effortlessly tie it together. 5. Hanging. Position your artwork at eye level. If your room has high ceilings you may be tempted to hang the piece higher, but consider an art gallery’s standard – the center of your artwork should be about 60 inches from the floor. 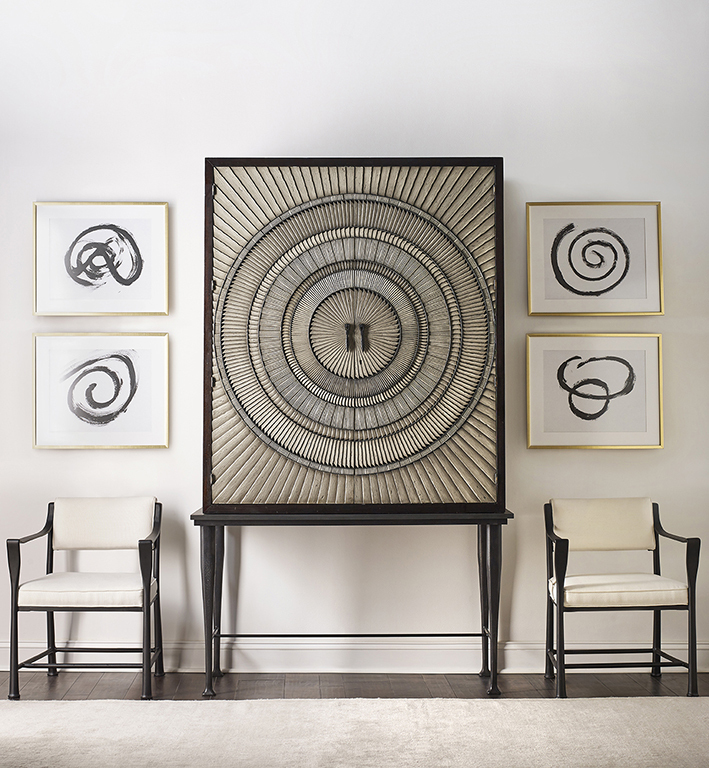 If you are hanging a grouping or collection, to find the center, treat them as if they were one piece. How would you hang you art? Comment below, I would love to share your ideas!